Syrian Forces Fire On Protesters, Kill At Least 8 Thousands took to the streets despite the near-certainty they would face gunfire, tear gas and stun guns, human-rights activists and witnesses said. The protests have evolved from a disparate movement demanding reforms to a resilient uprising that is now seeking President Bashar Assad's ouster. 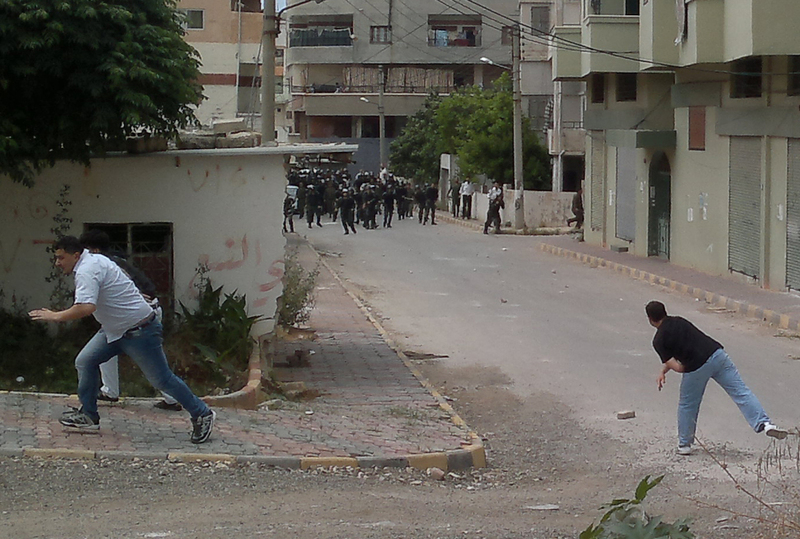 Men throw stones at riot police during clashes in the coastal town of Banias, Syria, on Friday. Syrian security forces opened fire on anti-government demonstrations Friday, killing at least eight people as thousands took to the streets despite the near-certainty they would face gunfire, tear gas and stun guns, human-rights activists and witnesses said. The casualties included three people in Qatana, a suburb of the capital, and four in the southern village of Dael, according to the Local Coordination Committees in Syria, which help organize the protests. One person also was reported killed near the border with Lebanon. The 10-week protests in Syria have evolved from a disparate movement demanding reforms to a resilient uprising that is now seeking President Bashar Assad's ouster. On Friday, protests erupted in the capital, Damascus, the coastal city of Banias, the central city of Homs and elsewhere. Human-rights groups say more than 1,000 people have been killed since the revolt began in mid-March — a death toll that has enraged and motivated protesters. Many activists have been opting for nighttime demonstrations and candlelight vigils in recent days, aiming for a time when the security presence has thinned out. "We refuse to let them sleep," a 28-year-old Dael resident said of the security forces. "We drive them crazy, as soon as they come to the neighborhood we go quiet and they get lost. And then we start again when they leave," he told The Associated Press. The resident, an engineer who asked that his name not be used, said the protest started at 2 a.m. and was peaceful until security forces opened fire an hour later. He said three cousins from the same family were killed. Since then, there has been a curfew in the town. "I cannot stick my head out the window; if they see a cat they'll shoot at it," he said. In southern Daraa province, birthplace of the anti-regime protests more than two months ago, the violence started overnight as people took to their rooftops to cry "Allahu akbar" (God is great). The rooftop protests are reminiscent of the cries from Iranian protesters in 2009 after disputed elections returned President Mahmoud Ahmadinejad to power. In the north, near Aleppo, demonstrators carried out similar rooftop demonstrations. A resident of the largely Kurdish town of Ain Arab said 3,000 to 4,000 people demonstrated. They modified the pro-Assad chant, "God, Syria and Bashar, that's enough" to "God, Syria, freedom and that's enough." "At 2 o'clock this morning, people were calling to God from the rooftops. The voices were very loud; the whole city was hearing it," the resident said. He asked that his name not be used, saying the regime was starting to terrorize families in an effort to intimidate leaders of the protest. A witness in Damascus, who asked to be identified only by his nickname, Abu Moustafa, said up to 1,500 people were chanting for the downfall of the regime in the Qaboun neighborhood. More than 20 buses carrying soldiers and security forces arrived on the scene, raising tensions, he said. At least two other gatherings also were reported in the capital. One witness in the central city of Homs, the site of some of the largest demonstrations in recent weeks, said thousands of people were chanting for the downfall of the regime. Security forces closed all the roads leading to the city center. Another witness said security forces threw rocks at protesters instead of opening fire on the crowd. North of Homs in Hama, scene of a huge massacre in 1982, activists said tens of thousands marched in the streets. Those figures could not be independently verified, as the regime continues to deny access to foreign journalists and aid workers. Also Friday, human-rights activist Mustafa Osso said Syrian security forces opened fire at demonstrators in the northeastern town of Deir el-Zour, but it was unclear whether there were casualties. The Local Coordination Committees labeled this week's demonstrations "Guardians of the Homeland," a reference to the Syrian army. Protesters are hoping that as in Egypt, army leaders will grow reluctant to fire on unarmed demonstrators. Analysts say for the moment the regime seems to be relying on plainclothes security forces to confront the demonstrators, but the army remains loyal to the government as well. Assad appears determined to crush the revolt, which is posing the most serious challenge to his family's 40-year rule. The harsh crackdown has triggered international outrage and U.S. and European sanctions, including an EU assets freeze and a visa ban on Assad and nine members of his regime. But the country is getting support from longtime ally Russia. Russian President Dmitry Medvedev said Friday there is no need to slap any new sanctions on Syria. Speaking at a news conference following the Group of Eight summit in Deauville, France, he also said Assad should introduce democratic reforms and stop using violence against opposition protesters. Turkey, which shares a 545-mile border with Syria and has been highly critical of the regime's brutal crackdown, said Friday that Syria may yet still be able to achieve stability. "What is needed now is shock therapy," Turkey's foreign minister, Ahmet Davutoglu, said in a televised interview. "If reforms are brought about now, this would open the way for peace and change." Assad has acknowledged the need for reforms, offering overtures of change in recent weeks while cracking down on demonstrations. Among his overtures to the protesters was abolishing the country's reviled state of emergency, in place for decades, which gave the regime unchecked powers of surveillance and arrest. Also Friday, Assad was quoted in Lebanon's daily As-Safir newspaper as promising there will be "no going back" on reforms. He did not elaborate. The protests in Syria are raising concerns that the unrest could spill over into neighboring Lebanon. The Syrian Committee for Human Rights said Friday that a leading opposition figure, 86-year-old Shibli al-Aisamy, a defector from Assad's ruling Baath Party, went missing along with his wife in Lebanon. The rights group urged Lebanese authorities not to hand him over to Syria.